Combine a half-day trip to Muir Woods and the seaside town of Sausalito with a hop-on hop-off tour by open-top, double-decker bus. Wander the paths through a coastal redwood forest, now a national monument. Then set out for the city's best-known sights at 20 different stops; ticket valid for 24 hours. 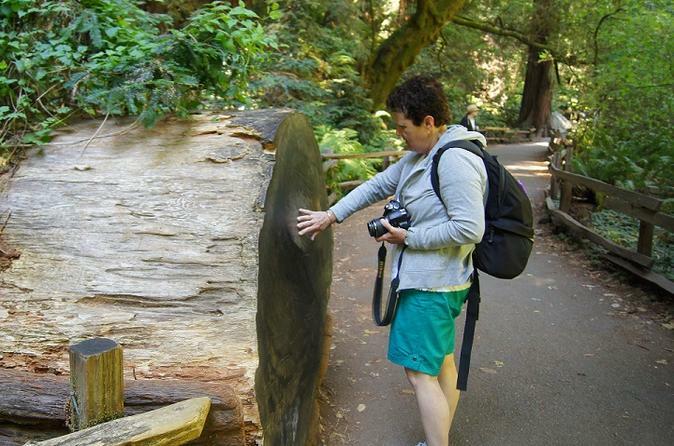 This ultimate package combines two half-day experiences with a visit to the California redwoods. Enjoy a 24-Hour pass on a double decker bus to see all of San Francisco's famous sites. Board your coach at Fisherman's Wharf and venture north over the Golden Gate Bridge to Muir Woods National Monument, an isolated canyon filled with coastal redwoods (entrance fee included). Wander among towering trees wrapped in Northern California’s signature fog, and smell the crisp fragrance while awestruck by the thick trunks and soaring canopies. Learn from your guide about this important piece of California's natural history along the way. Next, enjoy a scenic drive through the quaint waterfront of Sausalito town. Want to spend more time exploring its timeless cafes and artsy boutiques...hop off the bus and return to San Francisco by ferry boat (optional). Otherwise, enjoy the short ride back to San Francisco via the Golden Gate Bridge! See world-renowned San Francisco landmarks from an open-top, double-decker bus. Travel at your own pace, hopping off at 20 different stops to explore attractions that interest you most. Or stay on the bus for the entire 2.5- to 3-hour route. Learn about the city's fascinating history from live commentary or audio headset. See the Itinerary for a list of stops.